Deep beneath the Gritstones, Yoredale Rocks and Great Scar Limestones making up the familiar profile of Ingleborough are the basement rocks: the slates and greywackes – which are coarse-grained sandstones. As they are uncovered in Chapel-le-Dale and around the Ingleton Waterfalls Trail, they are collectively known as the ‘Ingletonian’ series of rocks. During the Ordovician Period some 480 million years ago, what is now Scotland, North America and North-West Ireland were all stuck together somewhere below the equator and formed a continent known as Laurentia. The narrow Iapetus Ocean separated this mass from what is now England, Wales and south-west Ireland. Rivers flowing into this deep water deposited sands and muds to form these basement rocks. After about 10 million years the plates below the sea bed clashed together and effectively buckled the horizontal basement rocks like huge sheets of corrugated iron. This explains why they are sometimes bedded vertically as in the above photographs. Around the same time, a mass of molten granite from deep within the earth’s crust simmered around the Ingletonian Rocks and effectively ‘cooked’ them, turning sedimentary sandstones into the slightly metamorphic ‘slates’ and greywackes characteristic of the Ingleborough basement. 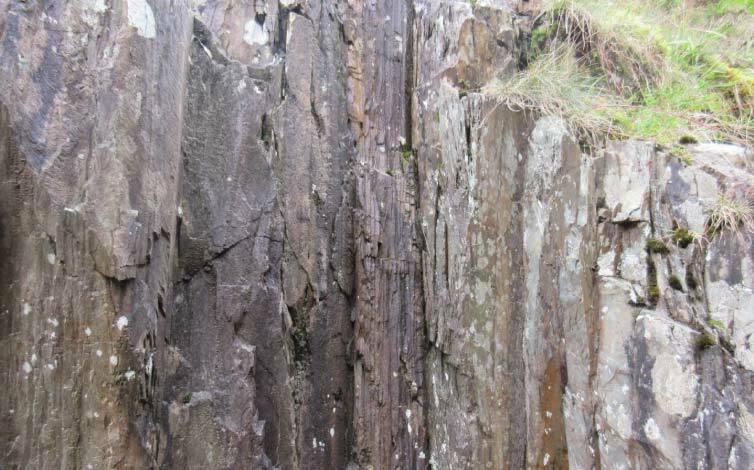 The Ingletonian Rocks can be recognised by their dark grey/brown and very smooth appearance, and by their distinctive lack of fossils which give away their great age. Along Chapel-le-Dale, the Ingletonian Rocks are about 3000 metres or 10,000 feet thick. Clearly, the mountain that sits on top of them is a mere mouse in comparison! Any ancient basement sequence surrounded by younger rocks and exposed by faulting and erosion is known as an inlier. In Ribblesdale, on the east of the Ingleborough massif, this inlier is largely composed of Silurian rocks (about 450–410 million years old) which have been lifted upwards along the North Craven Fault, and exploited by erosion and ice action. 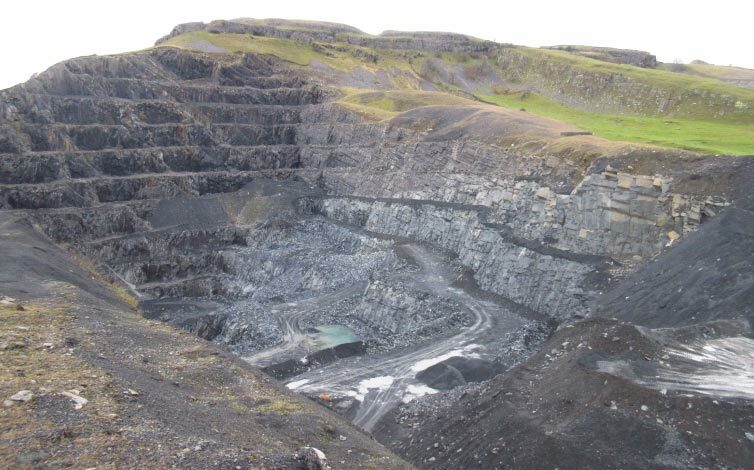 They are seen to spectacular effect in the Dry Rigg, Arcow and Foredale quarries. Here, the 340 million year old horizontal beds of Carboniferous Great Scar Limestone can be seen resting on the vertically-bedded basement – the surface of which is some 70 million years older than the limestone! 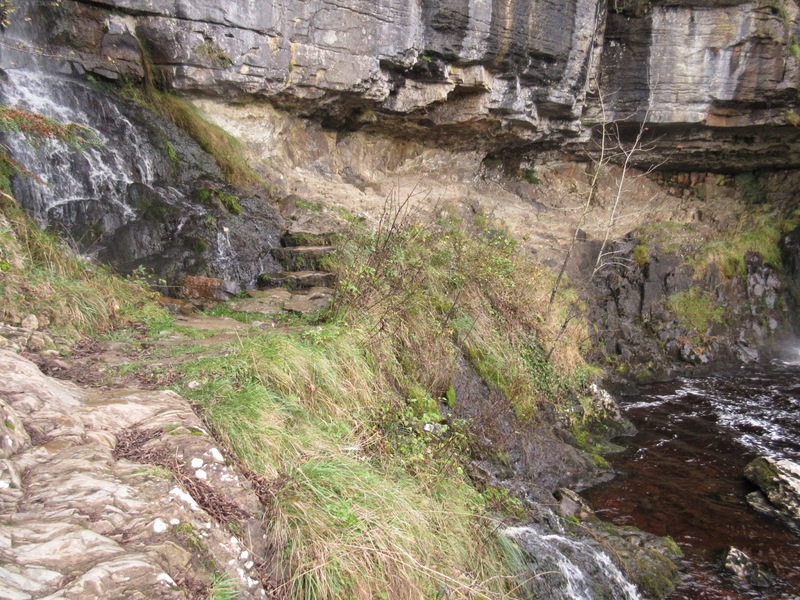 The marked division between the two beds is known as an unconformity, as there was no rock formation from the ‘missing period’ in between – the Devonian – when the Yorkshire Dales was effectively dry land. Perhaps the most awe-inspiring fact about this great basement is its vast variation in level due to buckling, folding and faulting. While the inlier appears at the surface in Ribblesdale, the same rocks lie an incredible 5000 metres (16,000 feet) below ground level in the Craven Basin, to the south of the Yorkshire Dales. We are talking here about movement on a clearly massive scale!